A car veered off the roadway and smashed into this house in Pacifica (July 31, 2016). 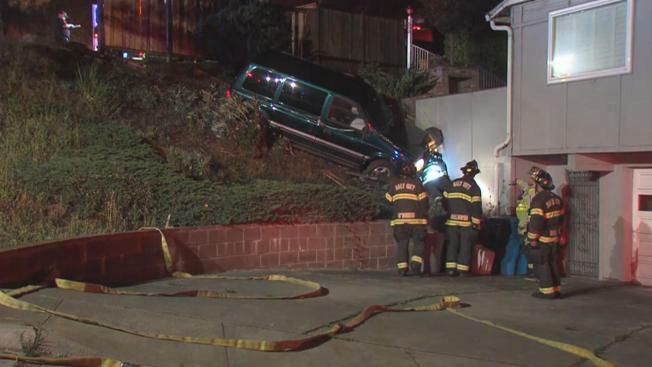 A woman was arrested on suspicion of driving under the influence after smashing her car into a house's gas meter in Pacifica, according to the Pacifica Police Department. The crash occurred early Sunday morning around 2:50 a.m. when a woman veered off the roadway and careened into a house's wall and gas meter, police said. The driver, identified as a 62-year-old female from Pacifica, was transported to San Francisco General Hospital for examination and upon further investigation, she was arrested on a suspected DUI, police said. Fire and PG&E crews were on scene of the crash as a precautionary measure in the case of any gas leak, police said.